In this timely book, Alex Callinicos explores the real meaning of the Bush Doctrine. He deconstructs the rhetorical justifications of the ‘war on terrorism’ and analyses the strategy of the Republican neoconservatives who now dominate American foreign policy. A controversial and provocative view on an extremely timely and important topic. Examines the neo-conservative foreign policies of the Bush administration and the "Project for the New American Century". Builds on the success of Callinicos’ previous book with us – An Anti-Capitalist Manifesto. Alex Callinicos is Professorof Politics at the University of York. Prologue: At War Between the Two Rivers. 1. The Rhetoric of Conquest:. Rogue states and the axis of evil. 2. The Cultists of Eternal War:. Bush II: the Republican right take the helm. Chronicle of a war foretold. 3. The Grand Strategy of the American Empire:. American strategy after the Cold War. 4. The Geopolitics of Oil:. The peculiarities of American imperialism. A return to inter-imperialist rivalries. "Essential reading for those who have fought against war over the past two years and who see it as the defining issue of our age." "This contemporary history by the UK's leading orthodox Marxist intellectual provides a satisfying narrative of the neo-conservative ascendance that enabled the second Iraq war ... New Mandarins of American Power is engaging, accessible and incisive." 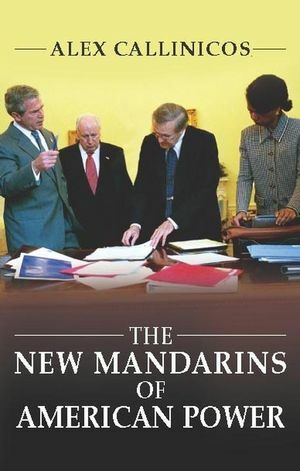 "Deeply informed, balanced, and full of insights, this perceptive inquiry explores the rational basis for the aggressive unilateralism of the Bush administration that has frightened much of the world, arguing plausibly that it" is based on a largely accurate reading of the long-term economic and geopolitical threats facing US capitalism". It more than fulfills its goal of contributing to 'an understanding of the strange and frightening world' that is taking shape." "Of all those seeking to make sense of rampant American power, Alex Callinicos succeeds, outstandingly with his razor-sharp analysis and eloquent warning to us all." Highly topical and will appeal to the media in the US and the UK.